In a survey of some of the western world’s biggest nations, the United States health care system as a whole comes off looking pretty badly. Aside from being patient-centric and effective, US health care is last or near-last in every major category of note, including quality, access, efficiency, equity, and healthy lives. However, there’s one place in the world where we can’t be touched: spending. The US spent $7290 per person per capita in 2007. 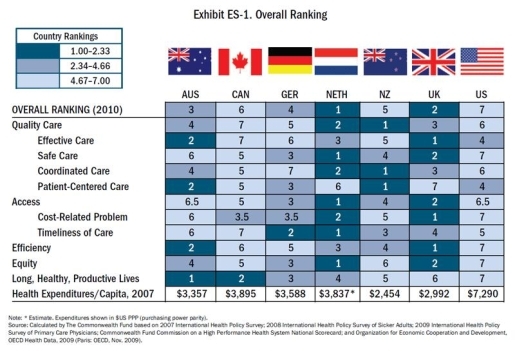 The US is the only country on the list that doesn’t have fully-socialized medicine, yet we spend the most on our care, if only because our solution to every problem is to throw money at it. Somehow, health care reform is supposed to fix all that. I’m not sure how, but that’s the reasoning behind why the law was pushed through Congress. Hey, if it can happen, I’ve got some unicorn meat to sell you. The US’s problem isn’t so much our health care system as it is our people. We eat too much, we eat too badly, and we don’t exercise. That’s why our health care is so costly and bad; we need more of it more often, and have more major ailments! Nobody can save you from yourself except for you.